She is skilled in soft tissue reconstructive surgery and wound management, surgical oncology, orthopedic surgery and adult stem cell treatment for osteoarthritis. In addition to the advanced surgery already offered at OVRA, Dr. Csiszer is certified in endoscopic stent placement for treatment of tracheal collapse and urethral obstruction in dogs. 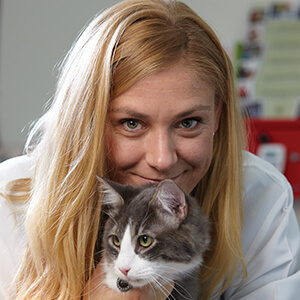 She received her Doctor of Veterinary Medicine from Tufts University in 2006. She completed a one-year rotating internship at Bay Area Veterinary Specialists in 2007 and a surgical internship with Veterinary Surgical Centers of the Delta in 2008. She then completed her residency in small animal surgery at OVRA in 2011. Dr. Csiszer also trained with New England Physical Therapy for Animals in the application of rehabilitation techniques for adjunct treatment of neurologic and orthopedic disease.